It is the end of (brief) era. This is the last Vixen episode to be reviewed. Considering that soon we will be reviewing Agents of S.H.I.E.L.D. and The Flash on a weekly basis, our Tuesdays were going to fill up anyhow. Anyways, here is our look at the final episode…at least until it is possibly renewed. 00:00 OK, this will be the longest episode yet, but it may be due to promos for The Flash and Arrow. 01:49 The power of causing your own African animal stampede is one of the most awesome super powers I have ever seen. 04:00 And nowadays, Detroit is even more primitive than Africa. 05:24 I just wish Felicity wasn’t separated from Barry, as I love that characters but don’t want to watch Arrow. 05:28 Can’t blame him for kissing her. 05:48 You just accept the name Vixen from someone you don’t even know like that? As I thought, the extra time was for promos for the upcoming seasons of The Flash and Arrow. I really wish this was shown as one solid cartoon, instead of 6 individual episodes. Still, there is a lot of good stuff. Nice action, likable heroine, decent backstory, althro awkward way to give her the name that comics gave her. I think of vixens as female foxes, and it seems like she should draw her name from African animals, althro “Lioness” would not be the greatest hero name either. It is hard to write a review when you have only 5 minutes or less of show to really cover. I will say that anyone who has avoided this due to being a cartoon should get over it and at least watch this last episode, if for no other reason than to see Barry and Oliver coping with each other. They should also enjoy the fight scene, which was fun and made a lot of sense. Like I said, more reviews (“Potshots”) coming soon. 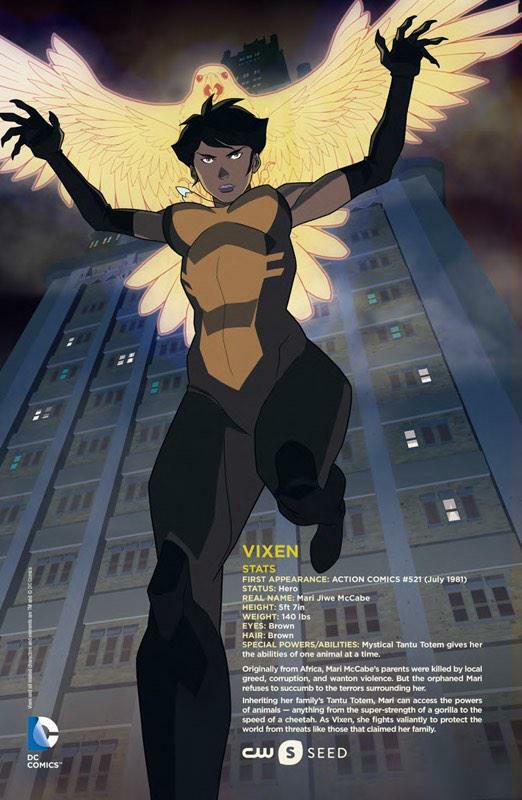 This entry was posted in Comics, Potshots and tagged DC Comics, Vixen.